Cool waters help Kansans escape the stifling heat of summer. Before the days of air conditioning, Kansans like Topekan Martha Farnsworth used the refreshing waters near Paxico to cool down. 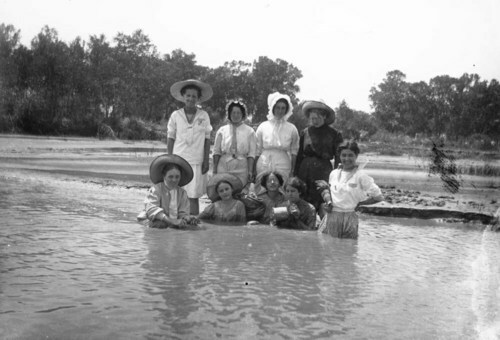 Swimming in ponds and streams was common in the early 1900s. Farnsworth and her husband, Fred, took a group of teenagers from her Sunday school class on an annual camping trip. They would pass the time swimming, fishing, and enjoying the outdoors. Martha recorded her memories of these outings in her diary in the 1910s. Swimming attire in the early 20th century could range from everyday wear to heavy clothing made for wading rather than exercise. In the 1920s people began to think of swimming as more than play and the clothing started to change to meet the need. Swimming pools began to gain popularity after the 1896 Olympic Games, when swimming was featured. Few Kansans had access to swimming pools until the 1920s.